WE are located in Parkway Storage, 1535 Pickering Parkway (east of Valley Farm Road). We are at the far east end of the buildings and our door faces the street. 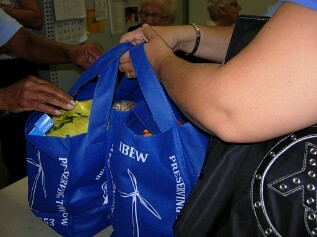 The food bank is open every Tuesday and Friday morning 10 A.M. to Noon (except holidays). What information do I need to register with the Food Bank? Names of all dependents in the household. Any person living in the household for whom you are financially responsible. Their names and ages will be listed on your government forms (e.g. Ontario Works). How often may I access the Food Bank? You are allowed a maximum of 2 visits per month. Are there other Food Banks in the area? Yes, there are 2 other food banks nearby: House of Hope (Salvation Army) and The Store Front . Both are in Ajax. Can I be registered with, or use more than one area food bank? No. You will be asked you to sign a waiver stating you will not use any other food bank. Please be advised that we have a working relationship with the other food banks in our area. Records are cross-referenced and if you are using the other services we will ask you to remove yourself from our registry. What food will I receive in my hamper? You can expect to receive a box of non perishable foods plus a choice of cereal, peanut butter, snacks tea, coffee, sugar, flour, juice, milk and eggs, bread and other items (subject to availability). Call 905-839-9537 and leave a voice message; or email foodbank@stpaulsonthehill.com. You will be contacted as soon as possible. You may also use the Contact Us page in this site to send us an email. Our food is donated by the people of Ajax-Pickering through mass food drives or individual donations. Fund raising by the food bank covers the cost of fresh milk and eggs.